The rivalry that exists between Microsoft and Apple has long been a familiar story as each company has been able to tell the tale of their existence amidst stiff competition from the other. In the mobile space, it's quite clear that Apple has taken a drastic leap in overcoming Microsoft as they arrived on the scene with iOS back in 2007; which made the stagnant look of Windows Mobile even more outdated. As much as the Redmond based company attempted to alter their last generation mobile platform, it proved to be futile in the long run. 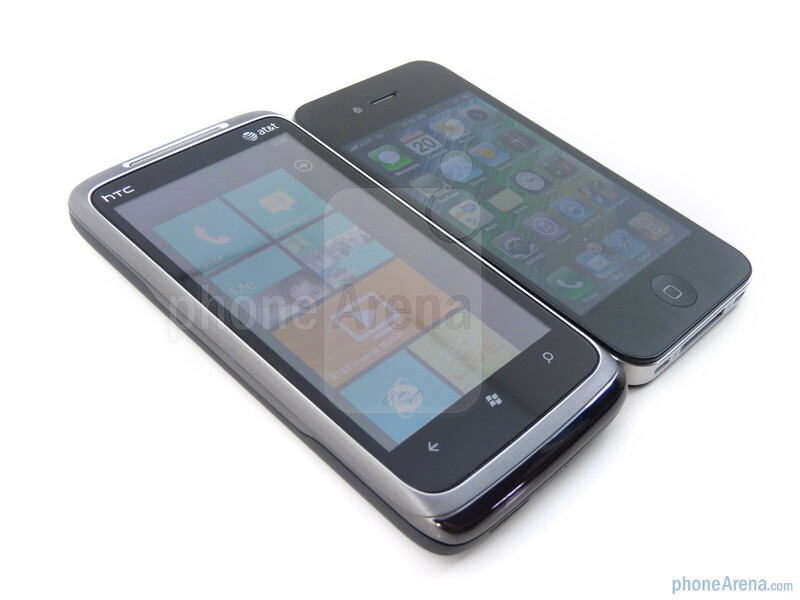 However, Windows Phone 7 completely sheds all previous remnants that Windows Mobile exhibited – thus bringing their brand name back into the spotlight with their built from the bottom up platform. 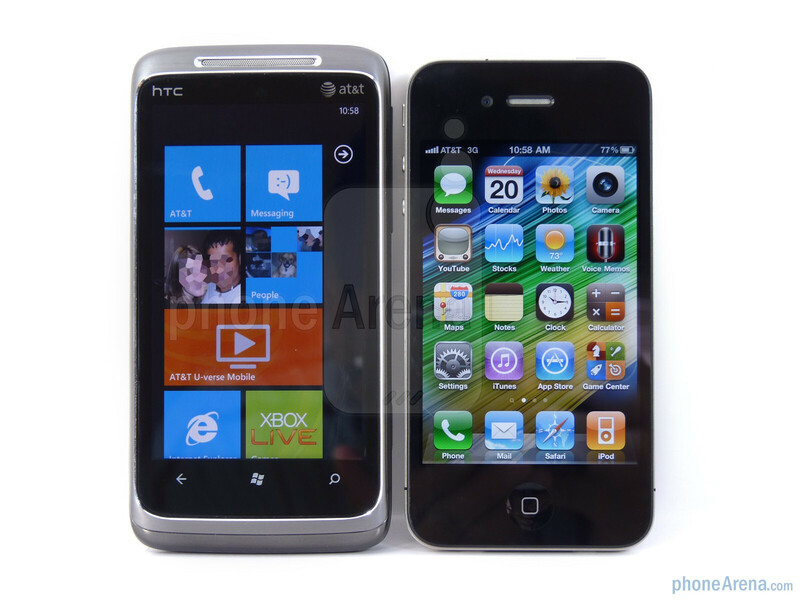 The HTC Surround is considered to be one of the titans for Windows Phone 7 that will help propel Microsoft's platform to catch up the mature OS powering the iPhone 4. In a classic clash of titans in the industry, we're witnessing two relevant devices showcasing their respective platforms as they attempt to gain visibility amongst the crowded mix of smartphones out there. If there is something worth being credited for, it has to be the slick industrial designs that both high-end smartphones exhibit. 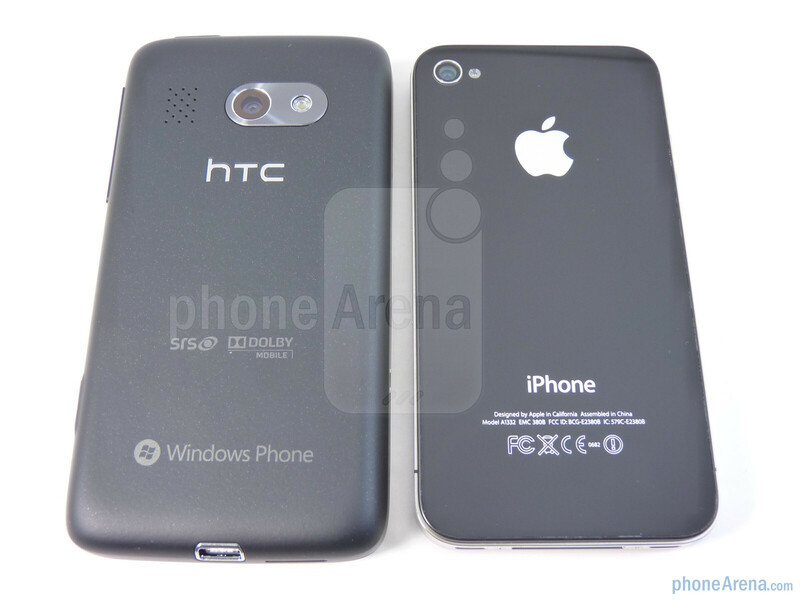 When you contemplate deeply about which manufacturers out there design the best looking handsets, both Apple and HTC come to mind very quickly due to their reputations of crafting some of the best devices out there. The iPhone 4 is considered by many as the epitome of a timeless design that shows off its enticing character, but not too far off, we witness some qualities that are seen with the HTC Surround as well. 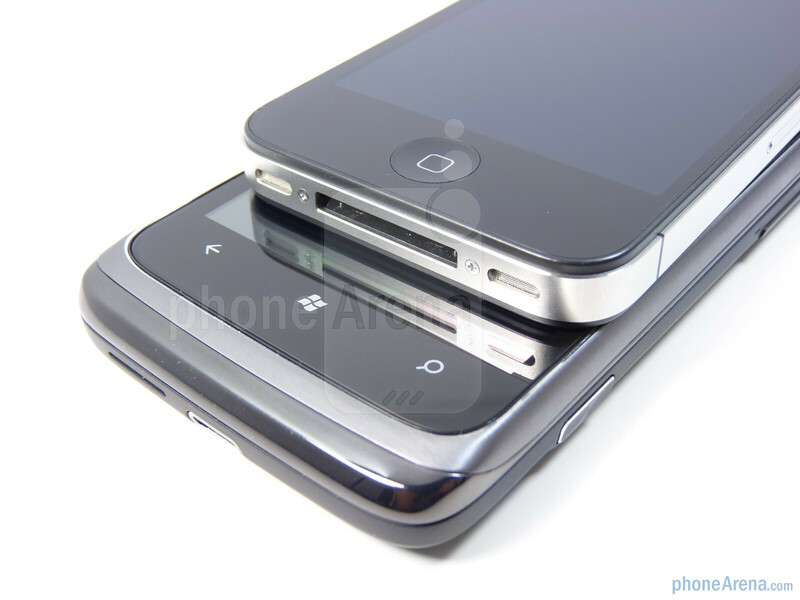 Premium materials are abundant as the Apple iPhone 4 encases itself with two solid gorilla glass pieces that are sandwiched together with a stainless steel brushed band. Conversely, the HTC Surround employs some metallic elements to its construction and is tastefully complemented with a soft touch matte rear cover. 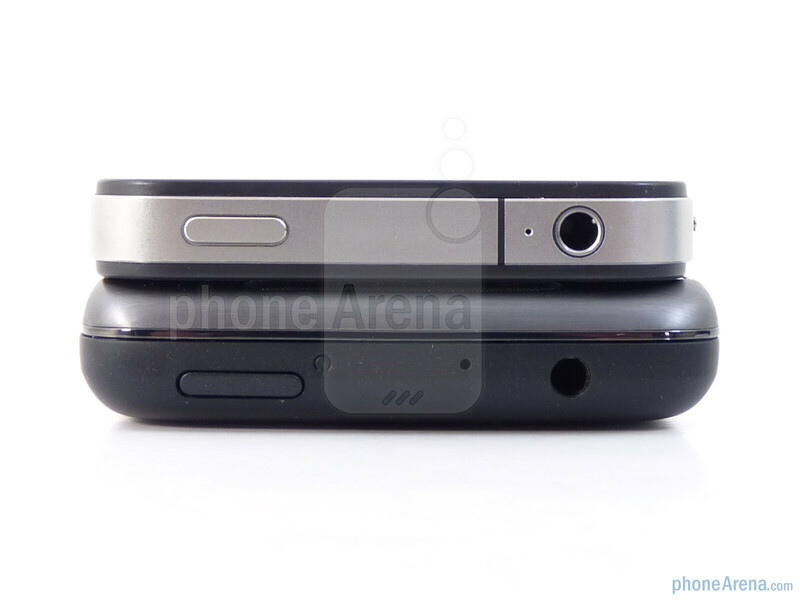 Between the two, it's evident that the iPhone 4 is still the more streamlined looking device, but the HTC Surround's larger size packs a well endowed speaker and kickstand. 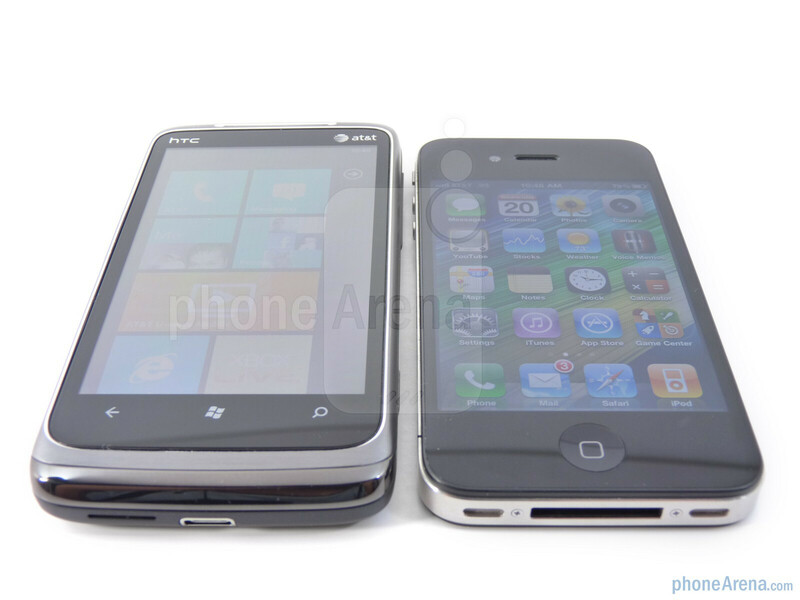 Nevertheless, both feel quite good in the hand as they don't feel too bulky. Even though they're both solidly constructed, we'd imagine that the HTC Surround would incur less damage from a severe drop because of its metallic exterior. Come to think about it, we'd fathom that the thought of concrete coming into contact with the iPhone 4's glass like exterior would make some people cringe. 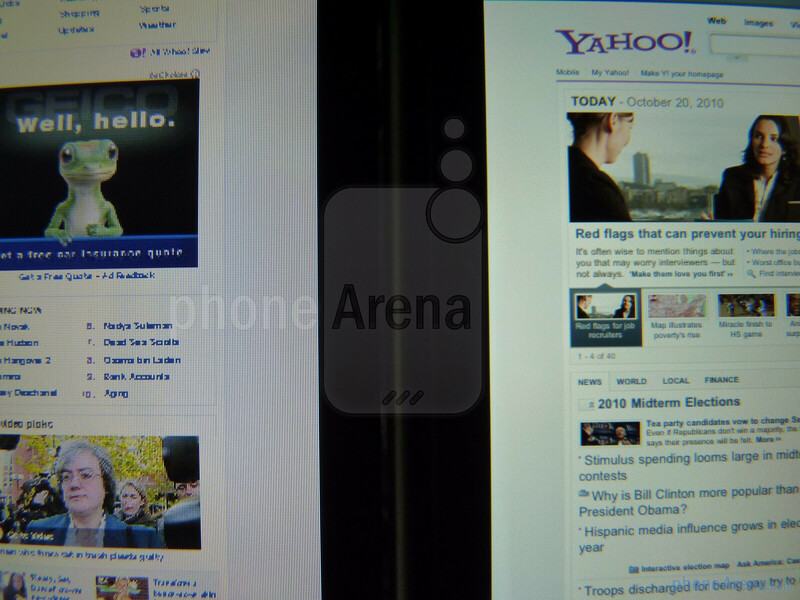 On the surface, some would assume that their displays would be similar, but upon closer inspection, it can be easily seen that the iPhone 4's Retina Display still proves to be a champ against most of the competition. 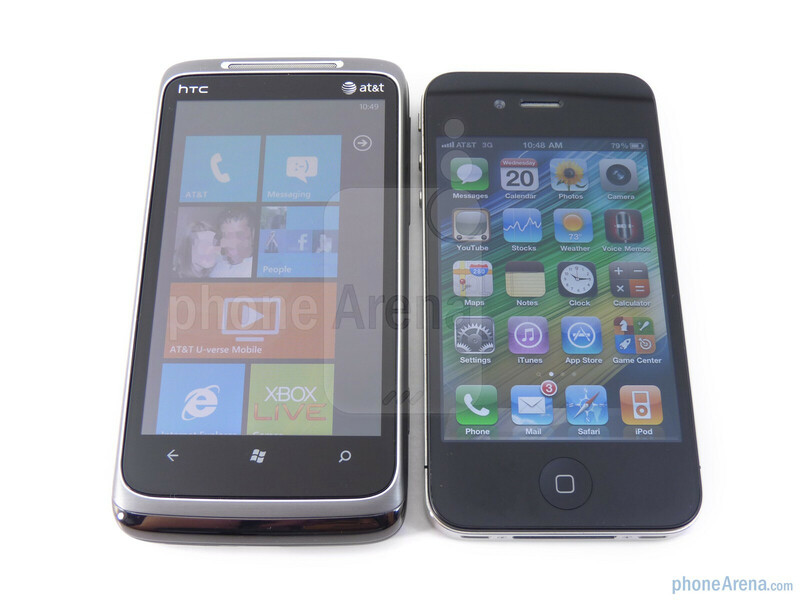 The HTC Surround houses a larger sized 3.8” LCD display with WVGA (480 x 800 pixels) resolution, while the iPhone 4 packs a smaller 3.5” IPS LCD display which has a resolution of 640 x 960 pixels. The obvious decision that most people will have to tangle with is whether to choose something that has a larger screen or one that outputs better clarity. In the case of bigger is better, the Surround would be a natural winner since it'll play to the needs of media-centric individuals out there. However, it's instantly visible that that the iPhone 4 has a higher pixel density – which makes for some stunning looking clarity even with the smallest of text. It's not to say that the WVGA resolution employed on the Surround isn't good, but the Retina display is truly popping with its natural colors, exquisite detail, and higher luminosity. Plus it's worth noting that the oleophobic coating on the Retina display will easily repel dirt and grime better than the HTC Surround. Thankfully, both are completely responsive to the touch and we didn't notice any major accuracy issues with either of them. Naturally, the single tactile and responsive home button with the iPhone 4 can't be accidentally pressed, but we're happy to say about the same thing with the Surround's three capacitive buttons. The reason being is that they are spaced far enough from one another and away from the edges of the phone. Either way, we're glad to see that there are fewer annoyances with the HTC Surround's capacitive buttons. With the Surround, its dedicated two-level shutter key is a desired option to allow instant access in running the camera app – something that the iPhone has been lacking. On the other hand, we prefer the iPhone 4's separate and clicky volume keys as opposed to the stiff feeling volume rocker with the Surround. Moreover, the vibrate switch with the Apple iPhone 4 is of course another thing we like since it enables you to silence the phone instantly. Similarly, both smartphones place their 3.5mm headset jacks and dedicated power buttons in the same location on the top edge of each device. In fact, there is no problem in pressing the power buttons of both handset since they're prominent and offer a good response when pressed. For power and data connectivity input, both can be accessed via their respective connections found at the bottom sides of the phones. 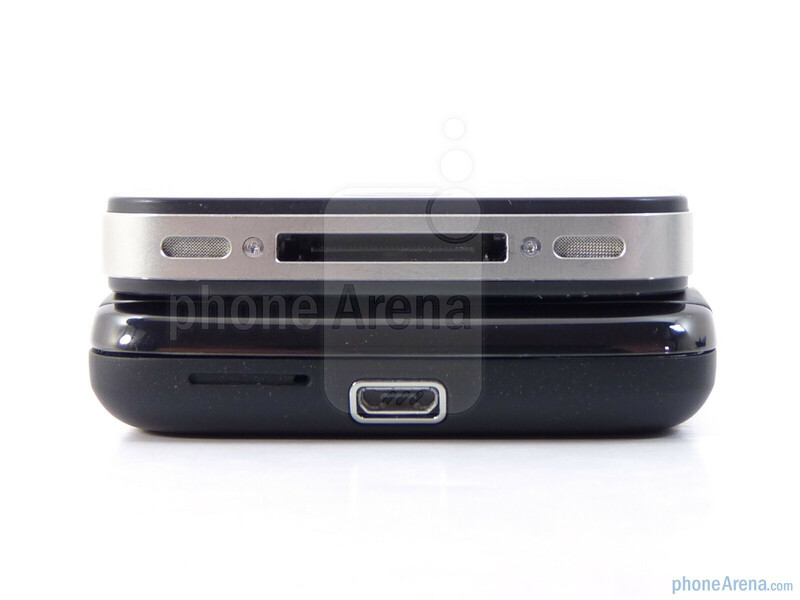 The HTC Surround packs a traditional microUSB port while the iPhone 4 employs Apple's proprietary one. 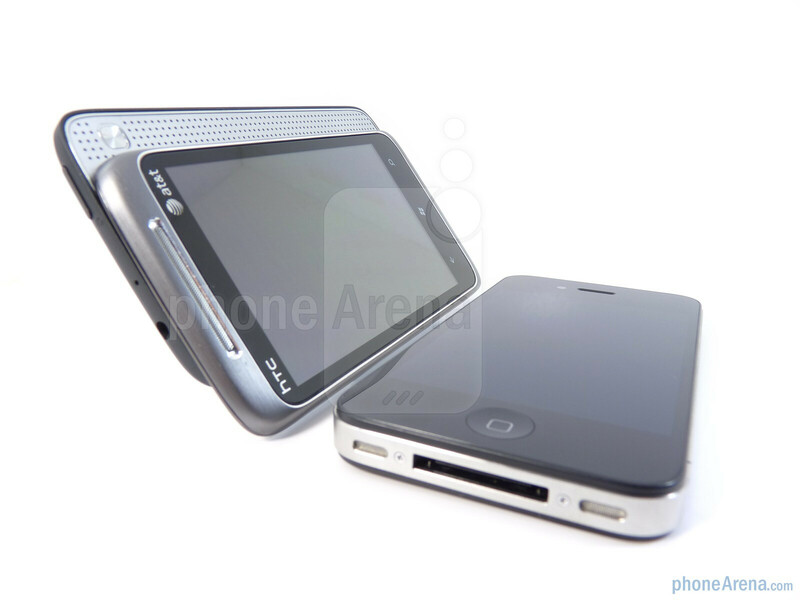 Additionally, the speakerphone is found in the same area on the iPhone 4, while with the Surround, you'll need to slide the phone open to expose its well sized speaker. At the same time doing that with the Surround, it'll provide access to the rear kickstand – something of course that can be seen as a novelty for some users. In the rear, you can expect to find both their 5-megapixel auto-focus cameras with an LED flash resting beside them. 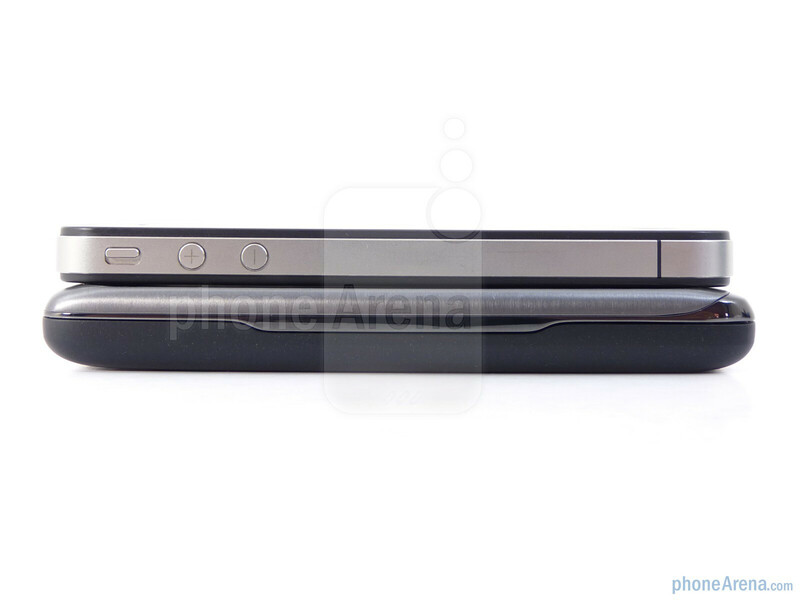 The iPhone 4 relies on using a micro SIM card, which can be accessed through the right edge of the phone. 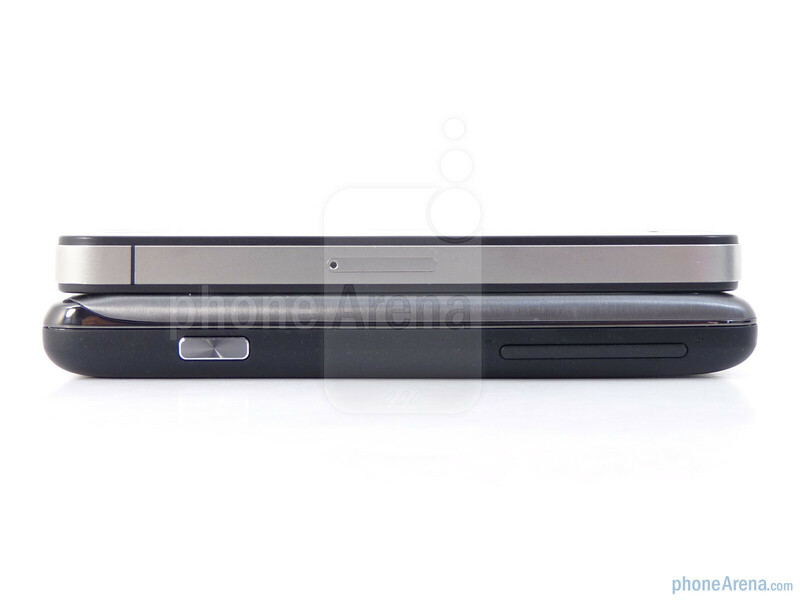 Oppositely, the Surround's rear cover can be removed to gain access to the regular SIM card slot and battery. Some will like the Surround's choice of having a removable battery since it doesn't require a rocket scientist to take it out, but with the iPhone 4, you'll have to ship it out to get it replaced since you don't have easy access to it. I like the new Windows Phone. 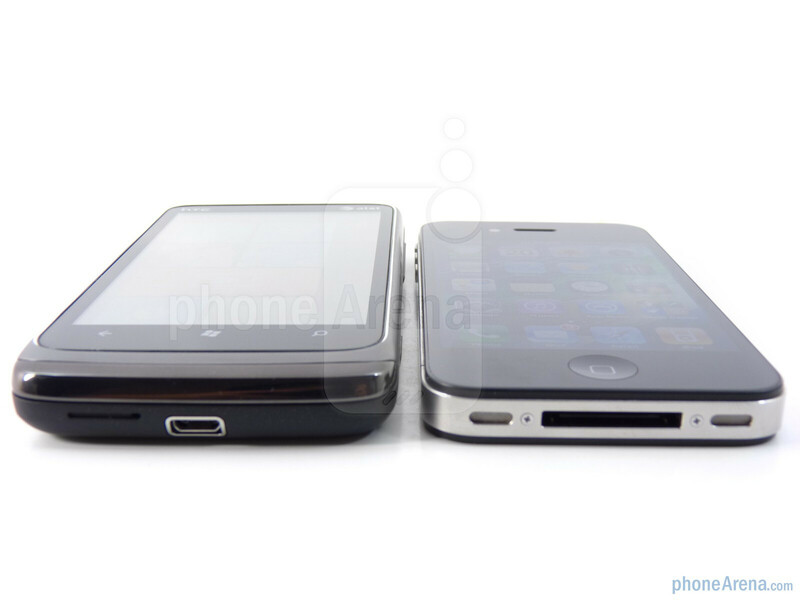 I rather see the comparison between the iPhone4 and the Samsung Focus. When is that going to happen, if at all? I've said it before, but you can download the wallpaper by using the "Wallpapers HD" app. Check it out, they have wallpapers optimized for the Retina Display. Sorry, but why wouldn't you compare the Focus to the iphone? I could have told you how this was going to go strictly by the reviews of the HTC surround. I don't really like the iphone but i still think it wins. 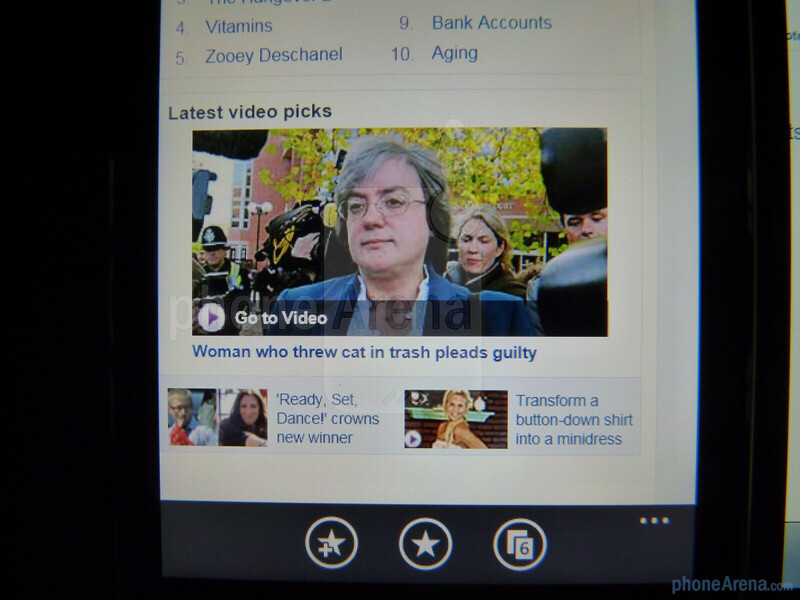 Obviously you should have use the Samsung FOCUS rather than the crappy HTC surround. - The Focus has a better screen. 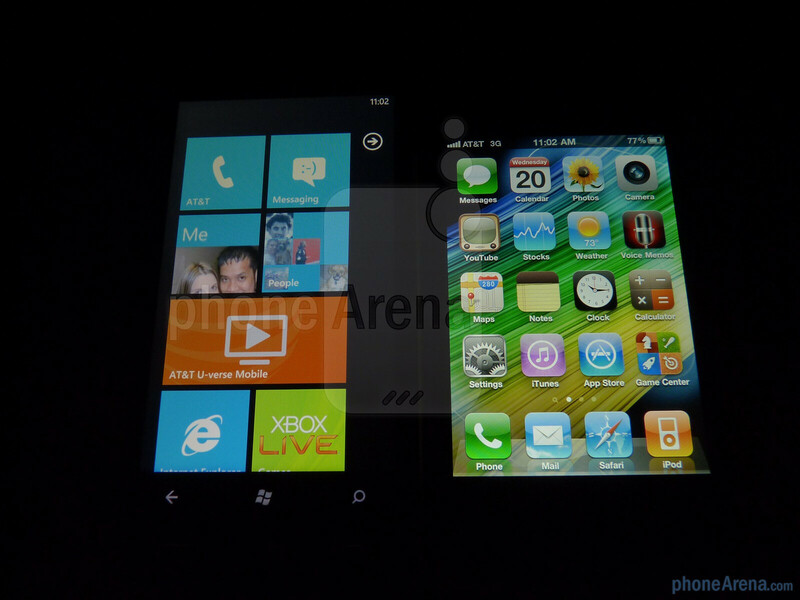 Indeed S-AMOLED is fantastic and better than Retina display, and of course better than the old LCD screen used by HTC. - The Focus has a slot for microSD cards, that allows the user to get up to 40GB of storage! Which is more than the 32GB storage of the iPhone. 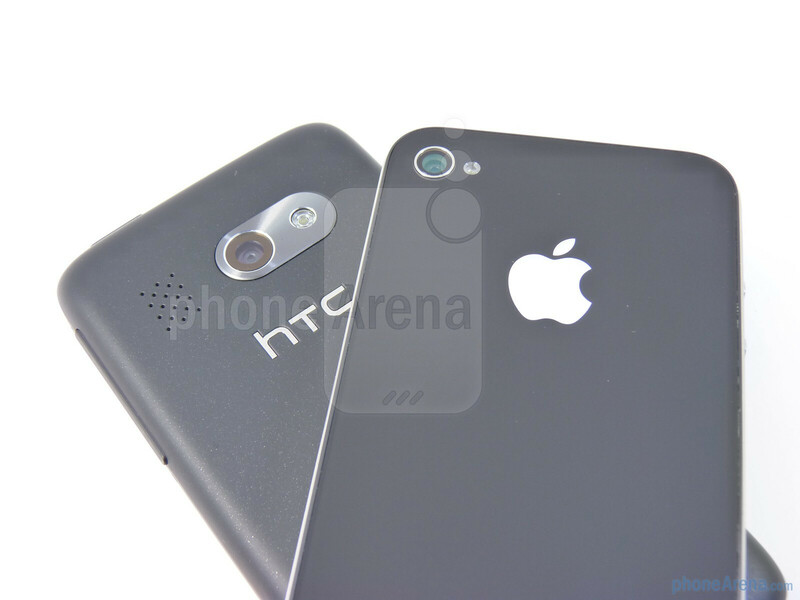 - The Focus, contrary to the HTC, with its quality camera allows very nice pictures and videos. 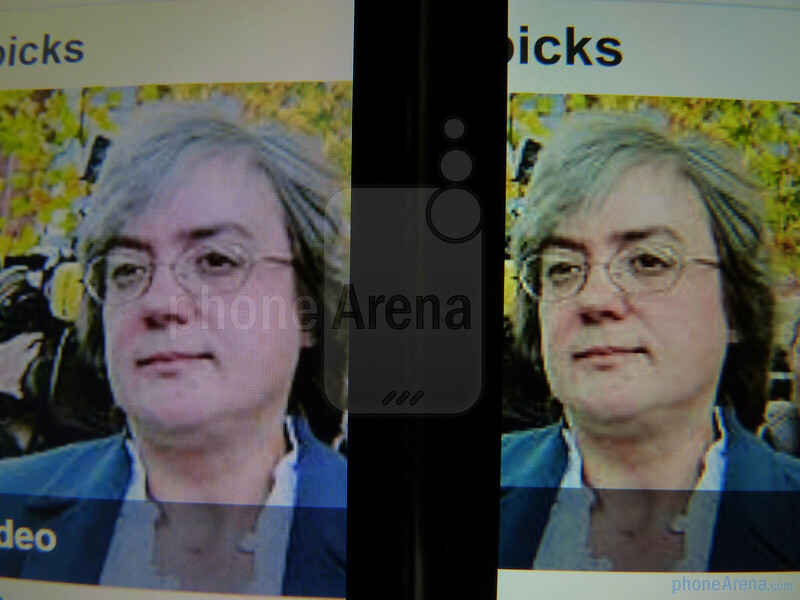 A comparison between Samsung Focus v iPhone 4 would have been more honest and objective. I agree with Arturo. The Focus is a better competitor to the iPhone. 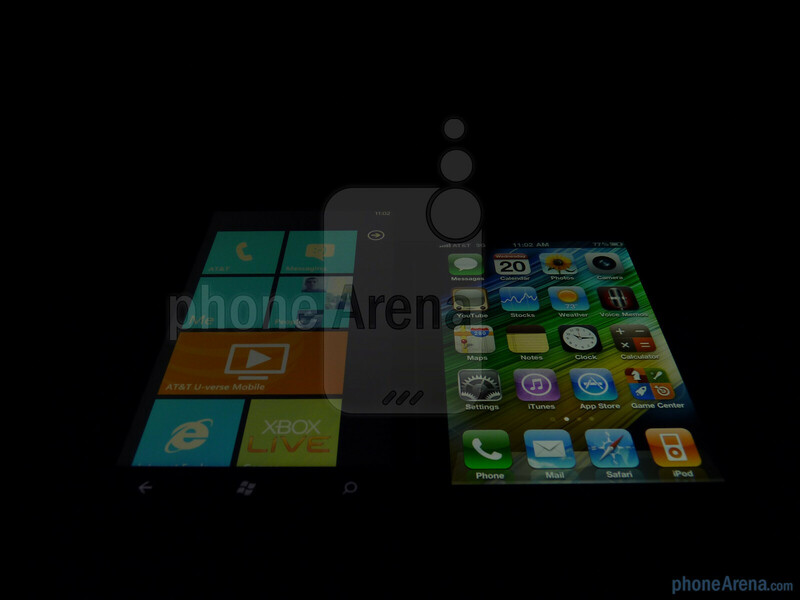 WP7 was designed in part to take advantage of the AMOLED screen. Battery life is better, as well as the contrast. 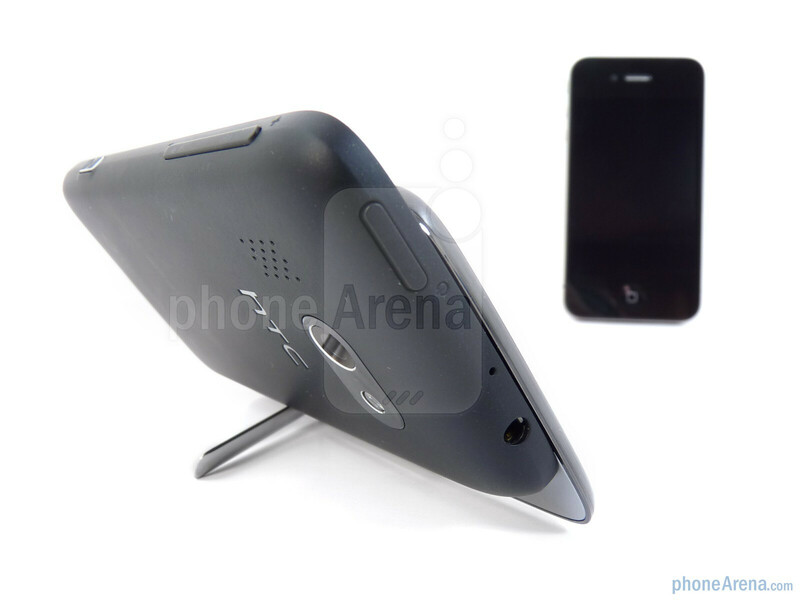 A comparison to the Dell Lightning or the HD7 would have also been appropriate. 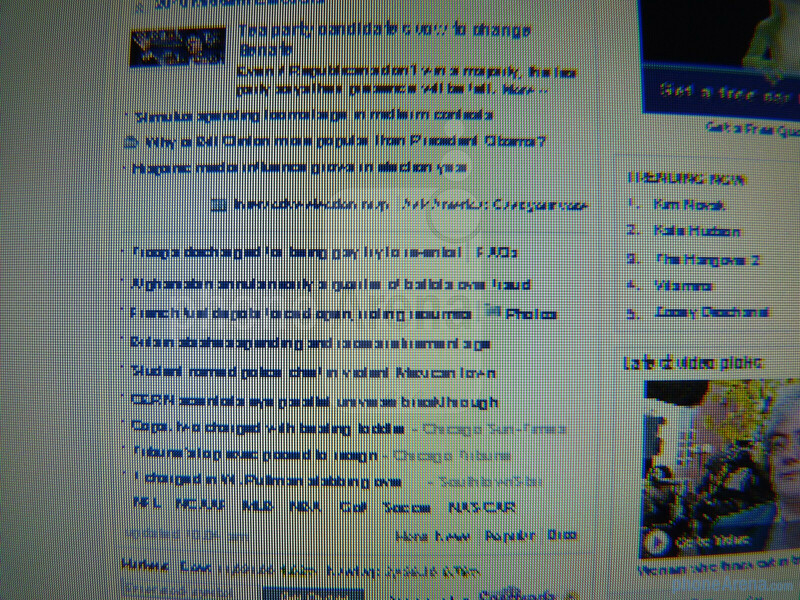 Hardware aside, I think that pinned items, hubs, and data aggregation should have been covered more. Apple is just about apps and what they do individually, and has none of this functionality. 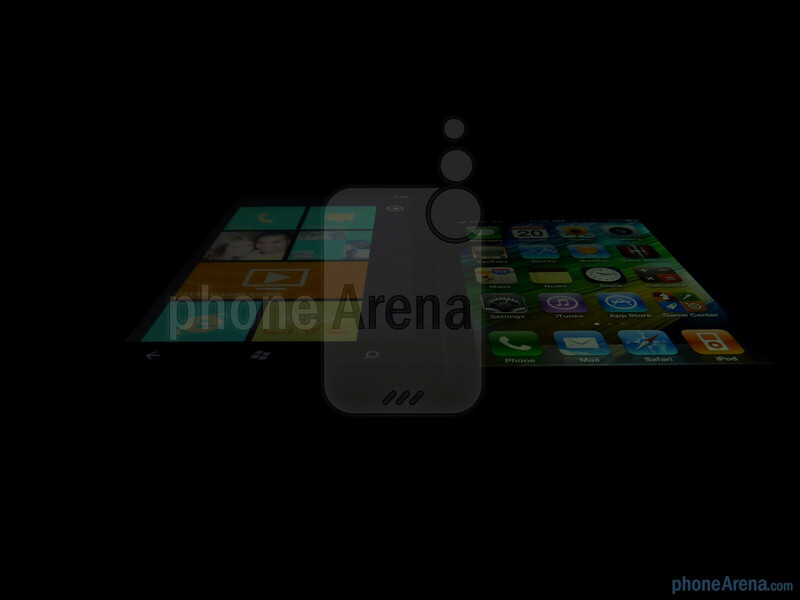 App hopping has always been a problem with their platform, where WP7 looks to address that. To leave out the strengths of a platform seems to be unfair. you talked about the retina display and fluidity of both platforms; however when you got to the map applications, you left out that you could pin locations to the start screen of WP7. To anyone trying to get to a saved location or itinerary quickly, this is a huge advantage on WP7 where you don't have to open the app and then search or use a favorite or recently searched list. not to mention the other pinned items you can have. with every iPhone app you HAVE to open the app first then go to the section for the data you want. one last thing.. XBOX LIVE... nuff said. 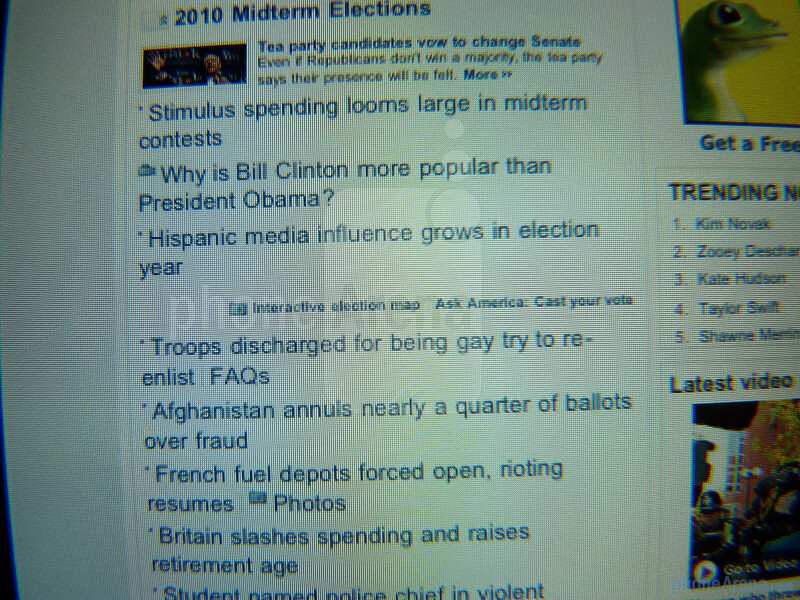 I do not like the not-colorful menu of the WINDOWS 7 OS. Yes, it is different! but ... it is minimalistic-ugly and confusing. There are moments when you are wondering - is this ON or OFF, is this an option or what, etc. There are some good phones - hardware-wise - but this OS is not mature enough. 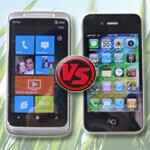 For me, clear winner is the iPhone and then the good Android phones. Does the Surround have a plastic screen or a glass screen? 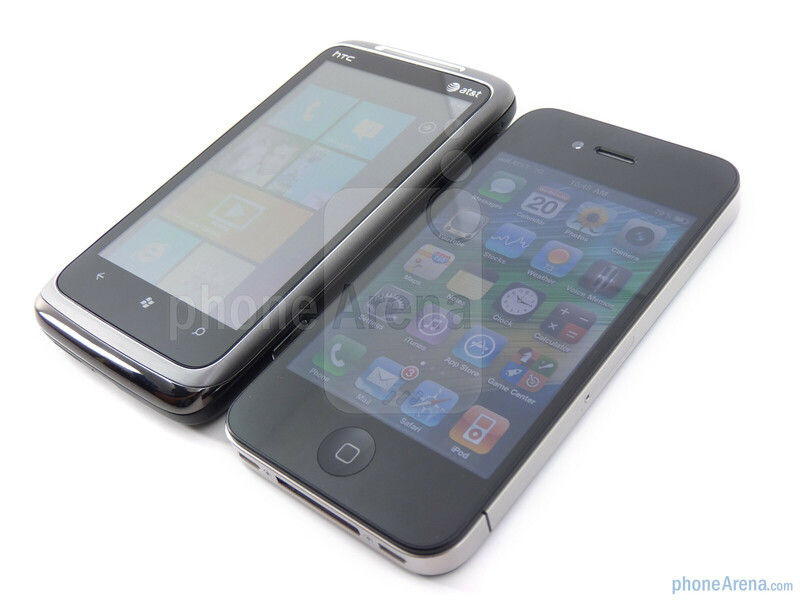 I'm considering getting the Surround or the LG Optimus 7 (Telus, in Canada), but my Vogue and TP2 had cracked LCD screens (leaving me with the multi-coloured liquid-under-the-screen-rectangle I'm sure many of you have seen). I miss a comparison of the soundquality out of the 3.5mm jack, using some high-end headphones. I think a lot of people uses their phones as music-players on the go. So for me, soundquality through the jack-plug matters a lot. Any thoughts on this? Thank you for the VERY complete and informative review, it was way better than the first 15 comparisons I found online. Keep up the good work, and thanks again.